One of the first steps (I don’t have a linear process so there isn’t really one first step) in my research is to tag all my blog posts. I didn’t really use the tagging feature when I wrote the original posts. 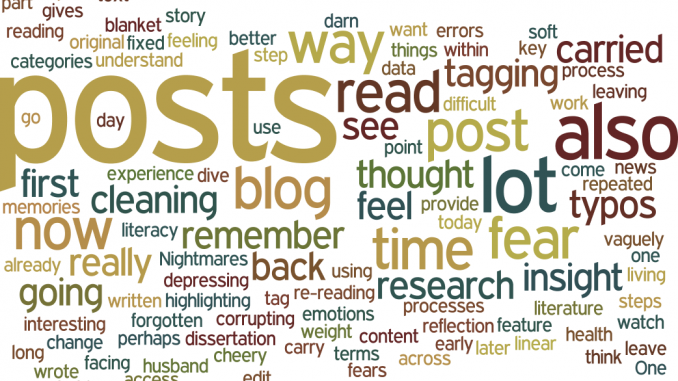 So now, I’m re-reading and tagging highlighting which posts provide insight into my experience with health literacy – but also key things within my story. I’m also cleaning up the post categories. I’m not cleaning up the text itself. I’m leaving in all the typos and errors. It is difficult to leave the early posts this way – the later posts have a lot few typos as I gave my husband edit access at some point and he fixed them. I don’t want to change the post content in any way, as that would be corrupting the data that I’m using for my research. I also think it wouldn’t be a reflection of what I was feeling at the time. The blog gives me insight into my thought processes back then. It is interesting to see how I repeated myself across posts, in part because I didn’t remember what I had already written. There are memories that I had forgotten about. Nightmares that I only now vaguely remember having read the blog post. What I also can feel as I read the posts is the emotions I was going through at the time. I carried a lot of fear. I carried that fear for a long time. I can see it my posts. I can feel it as I read through it, but only in a soft way. A lot of the fears I had back then don’t carry the same weight with me now. I’ve come to terms with what I’m facing, and I understand it a lot better. I am not living every day with a blanket of fear. And so with that cheery thought – I’m going to go do some reading of literature and perhaps dive some more into dissertation work, because any other news today is too darn depressing to watch.